What better place to ring in Autumn than Maryland's historic capital city? 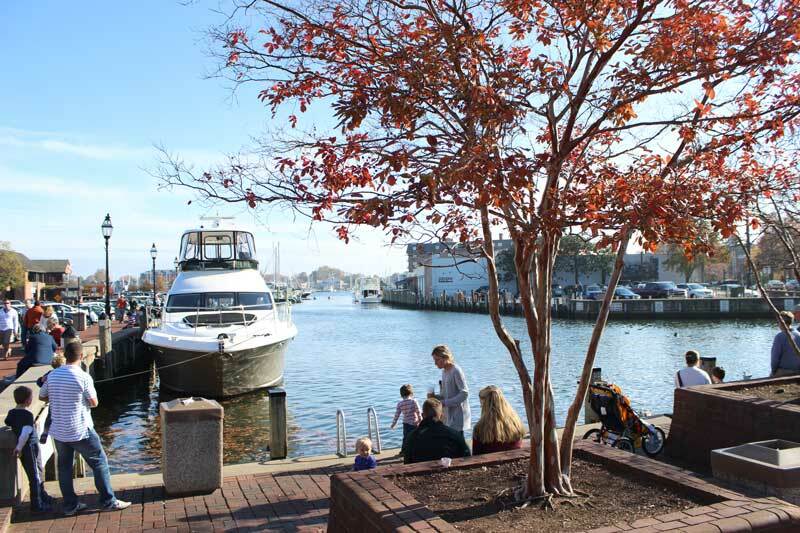 Come by land or by boat to experience fall foliage among the cobblestones and historic buildings, ghost tours and haunted pub crawls, festivals, and of course, the Annapolis Boat Shows the first two weekends in October. 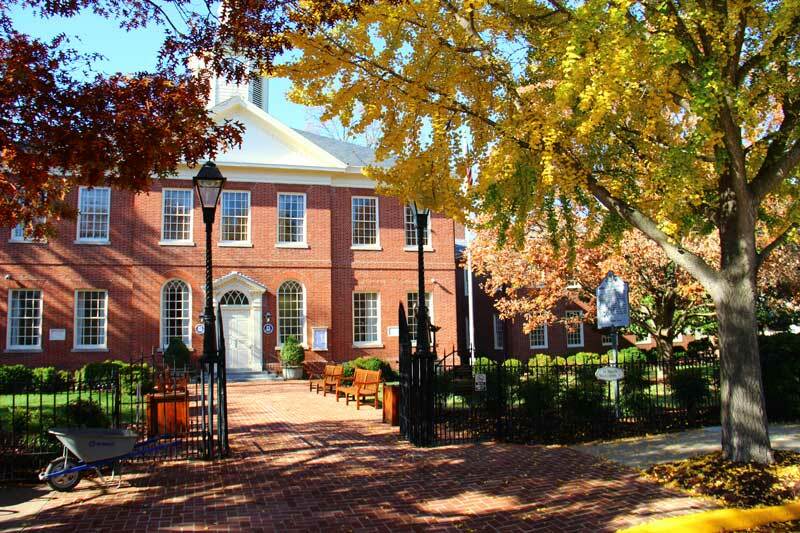 Fall foliage, boat shows, and haunted pub crawls - must be Annapolis in Autumn. Enjoy live entertainment, free parking, and the works of 100 local and regional artists as you stroll along the first block of West Street and Calvert Street for the First Sunday Arts Festival October 7 and November 4. Annapolis Tours and Crawls offers walking ghost tours of historic Annapolis and haunted pub crawls. During the pub crawl you will spend about 30 minutes each at three or four bars around town and enjoy a beverage while your guides regale you with haunted tales from that location. Tickets are $22. If pubs aren't your speed, opt for a nighttime ghost walk around downtown Annapolis' historic district. Tickets are $18. Fall often comes a little late to the Chesapeake region, but it's usually in the air by the time the United States Powerboat Show comes to town October 11-14! Check out our insider's guide to the Powerboat Show, including a sneak peak at cool new boats and products, to plan your visit. The town-wide Chestertown Harry Potter Festival October 5-6 is a blast for fans young and old alike. The festival benefits the arts in the local community and includes such events as a Quidditch tournament, scavenger hunt, charms class, Enchanted High Tea, a costume contest, wandmakers, an Azkaban prison break, and more. If the paranormal is more your speed, there will be two Ghost Walks every Saturday evening in October, at 6 and again at 7 p.m. Chestertown boasts more 18th century homes in use than any other Maryland community except for Annapolis, and while not all are “haunted,” many have rather unique and often strange stories from their pasts. From the tales of a haunt in the attic of the house where George Washington really did sleep, to the Court House Ghost that made international news a few years ago, guides will walk ticket holders through centuries of stories, told against a backdrop of local history. The last weekend in October, October 26-28, the town of Chestertown hosts Sultana Education Foundation's Downrigging Weekend, one of the largest tall ship gatherings on the East Coast. And you don't have to be a sailor to enjoy tall ships, trust us. There will also be live music, a Dock Dogs competition (come on PropTalk readers, we know you love your boat dogs! 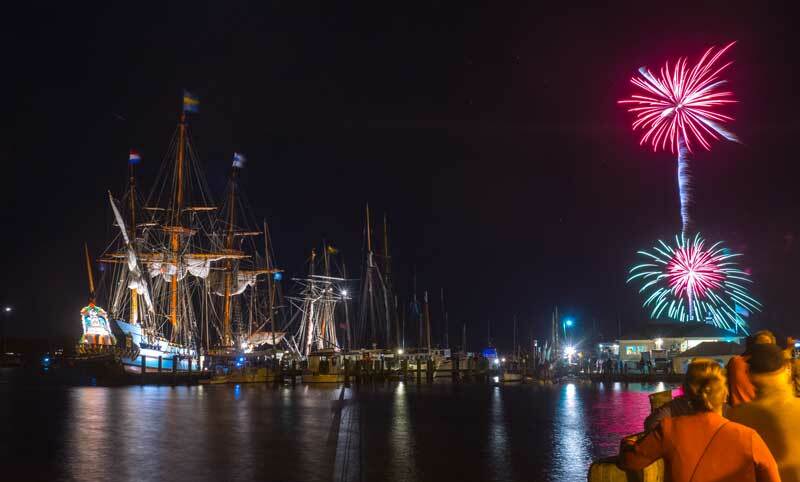 ), vintage cars and classic boats on display, a 5K and half marathon, river cruises, local cuisine, and an impressive fireworks show over the Chester River and the illuminated tall ships. Easton's Waterfowl Festival, November 9-11, has quickly become one of our favorite fall events on the Chesapeake. The first Waterfowl Festival was held in 1971 - it was conceived by a group of sportsmen and women as a way to share with visitors the unique Eastern Shore heritage that they treasured, in the hopes of preserving it before it was lost, while raising funds to protect the wildlife and habitat that were integral to the area’s way of life. Events, exhibits, and vendors are set up all around town so visitors can stroll from place to place as they take in the whole town. Highlights include painters and carvers demonstrating their work, local seafood and autumn treats, artifacts on display tracing the history of waterfowling, fly fishing demonstrations, live music, and so much more. Come by land or by boat, for the day, or stay overnight. Easton in November is pretty special. Stroll through town, taking in waterfowling and outdoor exhibits as you go. There always seems to be something fun going on in this Eastern Shore town, and fall is no exception. October 20-21, celebrate Fall Into St. Michaels with residents and businesses around town. The cool breezes, beautiful sunsets and charming streets and views offer the perfect setting for strolling. The annual pumpkin carving, pie baking contest and scarecrow contest will be held in the St. Michaels Community Center on Railroad Avenue. Stop by at vote for all your favorites, then grab a slice or two of pie, all proceeds benefit the St. Michaels Community Center! On Saturday from 10 a.m. to 2 p.m. St. Luke's United Methodist Church will have free Fall children's activities. The annual Jack Russell Races will take place Sunday, October 21 on the lawn of the St. Michaels Inn. All dogs are welcome at the event, big or small, racing or not, to mingle with other dog lovers in Talbot County. Dogs under 25 pounds are welcome to race. The proceeds from the benefit will go to the St. Michaels Community Food Pantry and Pet Pantries of Talbot, Caroline and Dorchester Counties. At the Chesapeake Bay Maritime Museum, the big event is OysterFest October 27. There will be oysters galore (obviously), along with local fare, craft beer and spirits, live music, scenic river cruises on the Winnie Estelle, cooking presentations, oysters demonstrations, an oyster slurpin' contest, Chesapeake Bay retriever demos, and more. Special to this year’s festival will be the re-launch of the 1889 bugeye Edna E. Lockwood, whose nine-log hull has been restored by CBMM shipwrights and apprentices over the past two years. Check out CBMM's floating fleet, and don't miss the re-launch of the Edna Lockwood during OysterFest. The town of Urbanna gets all decked out for the 61st annual Urbanna Oyster Festival November 2-3. Come by land or by sea to this walking pay-as-you-go festival featuring wine and oyster pairings, craft beer tastings, oyster shucking contests, an antique car show, educational exhibits, and vendors serving these bivalve delicacies every way you can imagine. 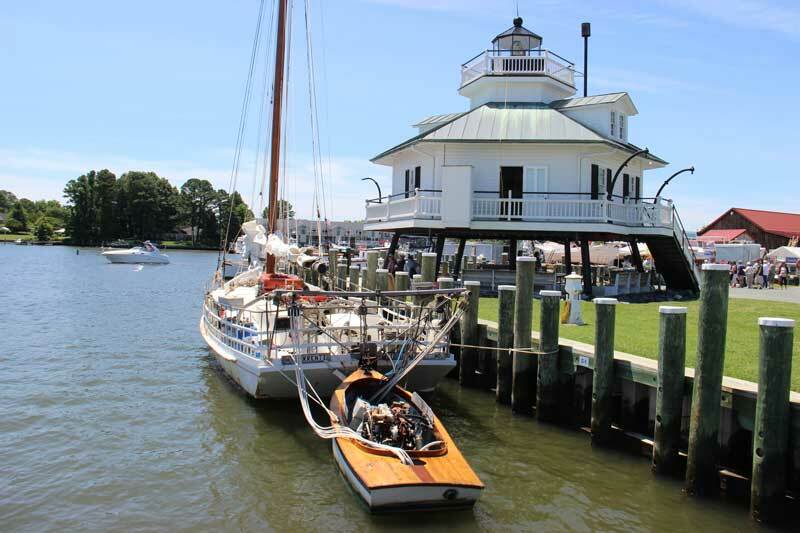 At the Urbanna Town Marina, visitors can board traditional vessels, including the Lynx and the Claud W. Somers skipjack, learn about Native American and colonial heritage, and the traditions of the watermen of the Chesapeake Bay. These are just a few of the many Chesapeake towns we simply love to visit during the fall season. For more Chesapeake Destinations, visit our See the Bay page.